There are some words that sound very similar but have very different meanings. When reading papers, I sometimes find the wrong word used in a sentence over and over again, and it is obvious that the writer did not trouble herself to find out the correct spelling. If you are unsure about which word to use, consult a dictionary, and always use our automatic spellchecker to find the mistakes. By misspelling these words, you could change the meaning of your sentence. 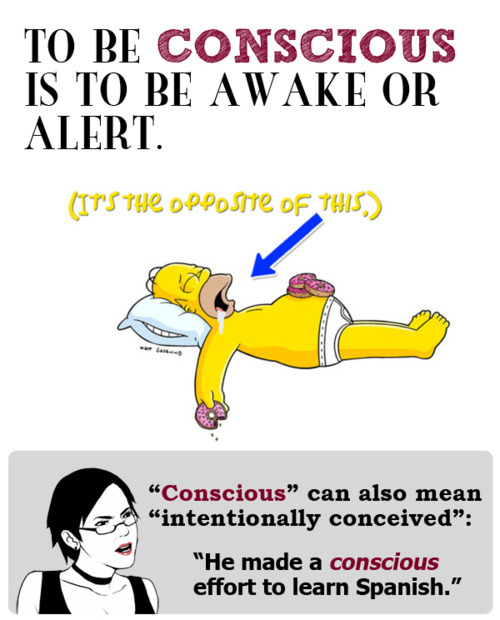 Use this post as a guide to remember which spelling goes with which meaning. 1. Lead/Led. Probably, the most troubling for me to see is the mistake between the words lead and led. So, I will start with these by giving you three different examples. Example 1: I will lead the students to the correct classroom on the first day of school. Example 2: Robert led the marching band in the parade last Saturday. Example 3: Some of the lead pipes, used as drains for the ancient Roman baths, are still in service today. The problem is that writers often confuse the 82nd element on the periodic table (lead) with the past-tense verb (led), because they sound the same. Lead can be either a present-tense verb or a metallic element, but only led can be used as a past-tense verb. 2. Their/There/They’re. 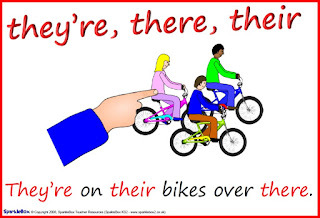 These words are usually always brought to attention when the subject is commonly misspelled words. However, it is inevitable that their, there, and they’re will each be consistently misused throughout writing assignments. Correct spelling is one of the marks of a truly excellent paper, so make it a point to use the right word when you are writing. Example 1: Their private business was booming in sales last month. Example 2: There are many different ways to brainstorm. Example 3: They’re going to the movies tonight. The best way to catch these words being used incorrectly is to re-read the sentence slowly to capture the true meaning of the word. Remember these definitions to help you next time you are determining between their, there, and they’re. Trust me, professors are impressed when the correct spelling is used, but they are highly disappointed when the words are used incorrectly. 3. Affect/Effect. These words are easy to remember once you learn which parts of speech they are. Example 1: Rising tuition rates might affect the number of college graduates in the upcoming years. Example 2: I am interested to know the effect that rising tuition rates have had on the number of college graduates in the U.S. 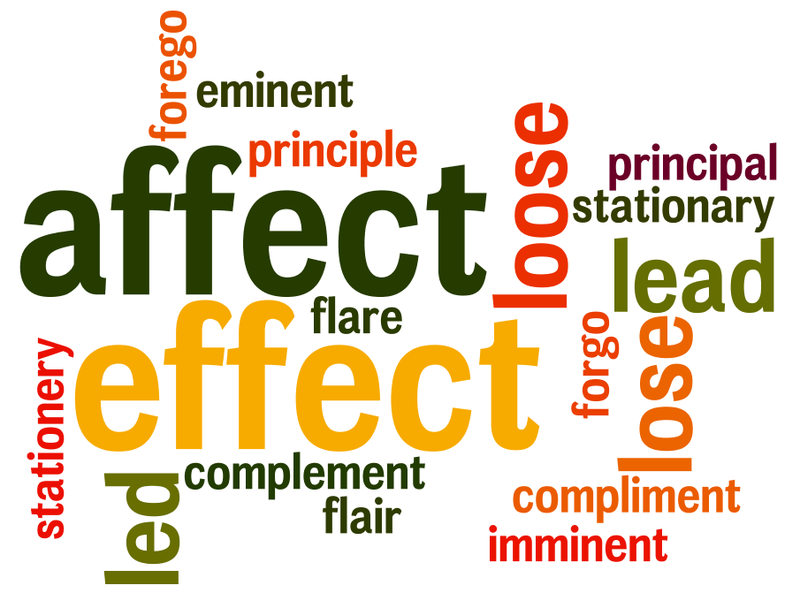 Note: Effect can be used as a verb, meaning to bring about or to accomplish. However, I recommend using a different word or phrase and only using effect as a noun. If you choose to use this word as a verb, here is an example of how it is properly used. Example: Many charity organizations have effected changes in relief efforts since the earthquake in Haiti. Instead of using effected, I would recommend the following sentence. Example: Many charity organizations have brought about changes in relief efforts since the earthquake in Haiti. 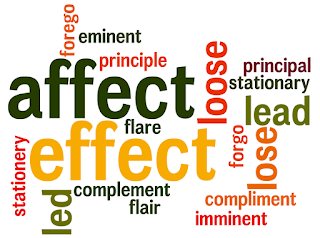 Remembering that affect is always a verb and effect is always a noun is a good method to keep from confusing the two words. 4. Conscious/Conscience/Cautious. These three words are hard to say, and it’s even harder to remember which spelling goes with which meaning. I try to remember that conscience has the word science in it, which helps me remember that it has to do with your mind and your internal reasoning to do good or bad. Cautious looks a lot like caution which reminds me that it means to be careful. Example: I regained consciousness shortly after falling and hitting my head on the pavement. I was unconscious for 2 minutes. Example: Frank cheated on the test last week, but Cameron couldn’t because his conscience wouldn’t let him. Example: Jane is very cautious when she lets her daughter play at the park. 5. Then/Than. These two words are extremely similar and are mixed up too frequently. The best way to tackle this confusion is to memorize the meanings of these two words. Here are some examples to help clarify their meanings. Than is always used in a sentence with a comparison, a preference, or a quantity beyond a specified amount. 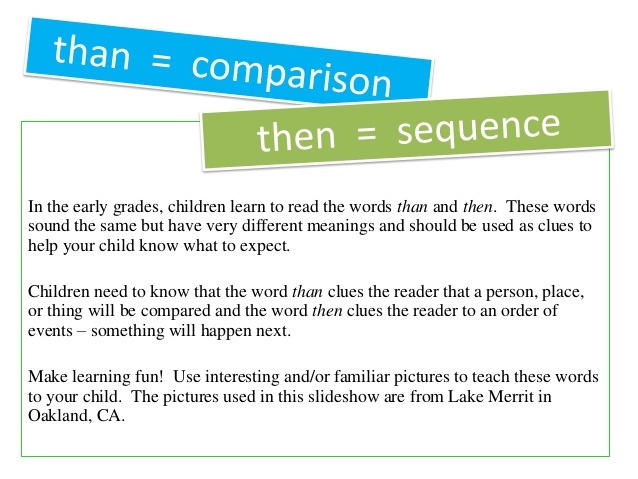 Anytime you are comparing two objects, use than. Example 1: I would rather see Iron Man 2 than any other movie at the theatre. Example 2: Danielle always received better grades in Chemistry than I did. Example 3: The recipe calls for less salt than I thought. Then describes a time in space or in order. Example 1: The sales department will have a meeting on Monday. Then, a new incentive program will be in place. Example 2: Years ago, we would ride our bikes by the lake. Do you remember back then? Logically, then represents a conclusion. Whenever you use the word if, you should always use then to represent the conclusion. Example 3: If Thomas shows up to the game, then he will be the pitcher. 6. Your/You’re. 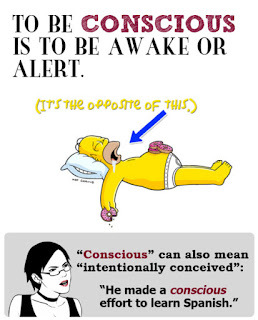 You're is a contraction. It is the combination of you and are. We say it all the time, but when it's written, it's usually spelled incorrectly. Your is an adjective describing a noun (Whose dog is it? It's your dog, not you're dog). Example: Your dog just ate my food, and now you're going to have to buy another meal for me. If you're ever unsure of which spelling is correct, try saying the sentence using you are in place of the word each time. If it fits, then use the contraction you're. If not, use the adjective your. Example: You are dog just ate my food, and now you are going to have to buy another meal for me. It doesn't fit in the first clause (so we use your), but it does fit the second time (so we use you’re). 7. Accept/Except. Read the following sentence for clarification about these two spellings. Example: Everyone in the room accepted the fact that there would be no air conditioning except Connie, who started crying. Remember that the word exception means that something or someone has been exempt from the group. This helps me when I’m determining between accept and except, because the latter singles out an object. These words (that sound alike but are spelled differently) are called homophones. At least be aware of possibly confusing some of these words with the wrong meaning. Always use a dictionary if you are unsure of the spelling, and double-check your work with our free spellchecker that is excellent at catching these errors.